Post-it » Blog Archive » We want the finest wines available to humanity. We want the finest wines available to humanity. According to AlphaGalileo, the background lighting provided in a room has an influence on how we taste wine. This is the result of a survey conducted by researchers at the Institute of Psychology at Johannes Gutenberg Universität Mainz, Germany. 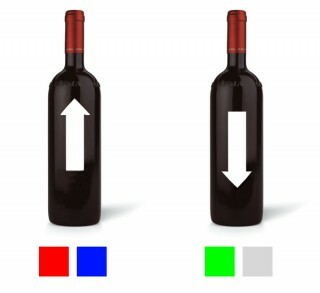 It was found that the same wine was rated higher when exposed to red or blue ambient light rather than green or white light. The survey showed, among other things, that the test wine was perceived as being nearly 1.5 times sweeter in red light than in white or green light. Its fruitiness was also most highly rated in red light. Riesling combined with green light was not appreciated. Accordingly, one conclusion of the study is that the color of ambient lighting can influence how wine tastes, even when there is no direct effect on the color of the drink. This opens up an interesting possibility; you could perhaps make use of only one type of wine to support the different courses of a dinner. Just modify the lighting conditions. The wine steward, or sommelier, will turn into ‘Light DJ’.